LG will launch a 32 inch OLED TV as early as 2010. The electronics manufacturer also confirmed a release date for the much mooted 15-inch OLED TV which is on display at this year's IFA show in Berlin. 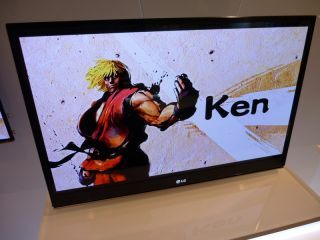 At the LG stand, LGs Korean Engineer Jeong Woo Choi told TechRadar that LG is not too far from putting 32-inch OLED TVs into production, and that they would go on sale in Europe in 2010. "The 15-inch OLED is to be put on sale in December this year," said Choi, "and we aim to launch our 32-inch model at some point next year". It had previously been reported that LG had decided 2012 would be the year for 32 inch OLED screens while Digitimes reported in April that LG was planning 32 inch OLED TVs for 2010, but this seems to have now been confirmed by LG itself. OLED technology offers an alternative to LED backlit LCD TVs. While the the screens are brighter and thinner than current LCD TVs, no manufacturer has been able to make large sized OLED panels with high enough yields to make them economical.